Daniel Hunt, 30 years old. 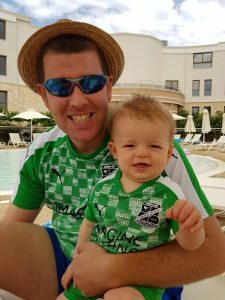 I’m Swindon born and bred, growing up in Lower Stratton and regularly making the pilgrimage up Shrivenham Road to the County Ground with family and friends. Swindon Town F.C. is in the family – my second cousin is one of Swindon’s greatest players, Ernie Hunt. I am now supported by a little family of my own – living in Liden with my wife Kara and little boy Anderson (named after England fast bowler Jimmy Anderson). I’m absolutely sports mad, following STFC and English cricket around the country. I play cricket for Swindon United Churches CC (based in Sevenhampton) and volleyball (yes, volleyball!) for Wootton Bassett Volleyball Club. 2. Whats your day job? I work in Nationwide Building Society’s “Payments Industry Team” – representing Nationwide’s members’ interests relating to different Payment types and the Scheme bodies that govern those Payment types. Ranging from the humble Paper Cheque, through to modern digital payments such as ‘Paym’ and ‘Samsung Pay’. Much of my future work will be related to the UKs NPA (New Payments Architecture) and ensuring that Nationwide are ready to participate in this. 3. How long have you been a Swindon fan? Ever since my Dad took me to watch Swindon Town beat Wolves 3-2 at the County Ground in October 1994. I was hooked from that moment on! 4. Why did you join the STFC trust board ? My initial interest was in helping to run the Trust STFC Twitter account, which I’ve been doing since the start of June 2018. But upon meeting the rest of the Trust STFC Board members in early May 2018, I came away staggered by the ongoing work behind the scenes. I was completely inspired by the shared passion for Swindon Town F.C. and I want to be a part of that from within the Trust, helping in anyway I can do. 5. What expertise do you bring to the Trust board? Do the Trust STFC Board need someone with a Degree in Human Geography? Well, now they’ve got one! On reflection, I should have studied written/broadcast journalism at University. I’ve grown up with a passion for sports writing and have previously written/pod-casted for “The Washbag” STFC website. I consider myself to be a handy communicator and particularly social media savvy, although I once managed to get Sam Morshead and the Swindon Advertiser banned from the County Ground (Nile Ranger shirt gate!). I now channel all of these passions through running the social media sites for my cricket club and Trust STFC. 6. Whats your vision for the football team on the pitch? This is a pretty simple one for me, I want to see a winning Swindon Town team, playing with pride in the shirt. Easy to say, very hard to achieve. The mad 20 months that Di Canio was in charge was a perfect example of what I’m after – high tempo, attacking football and some fiercely committed/talented players. 7. Whats your proudest moment as a Swindon fan? Despite our relative struggles over my 24 years of support, I’ve had some wonderful moments following STFC. Despite losing on penalties at the Withdean in 2004, that Town side deserved so much better and I was proud as I stood there absolutely soaked on the temporary seating. Winning 3-0 at Leeds United (Paynter 2 and Austin) and 1-0 at Southampton (Austin) were right up there… but if I had to pin it down to one moment, it would be the penalty win at the Valley to take us to Wembley in 2010. That Town side was superb and came back from a goal down and a man down. Marvellous night! 8. Who has been your favorite ever Swindon player and Manager? Honourable mentions for Sam Parkin, Matt Ritchie, Simon Ferry and Nathan Thompson. But my favourite would have to be the darling of Swindon Town, Charlie Austin. His rise from non-league obscurity to firing us to Wembley inside 6 months was magical. Best natural finisher I’ve seen at STFC and he’s very unlucky not to have won England caps since leaving STFC. And manager – Di Canio, hands down. Absolute mad man, amazed it lasted 20 months. Miss him terribly, STFC felt invincible during that period, beating many higher ranked sides in the cups. 9. Whats your overall vision for Swindon Town football club? The most important thing for me, the only thing that ultimately matters, is that Swindon Town FC continues to exist. I want my son to fall in love with football like I did. But if I was being far more ambitious, I want Swindon Town F.C. to be a well run, community football club. For the people of Swindon and Wiltshire to be proud of. Success on the pitch would be a nice to have.